Players do not have any influence in the ourtcome of these games. Probably they would be more adequate as horse racing games than as cycling games, though betting has always been an important part of track cycliing. 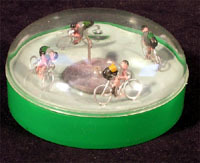 Keirin, for instance, was originally (and still is in Japan) a betting sport.